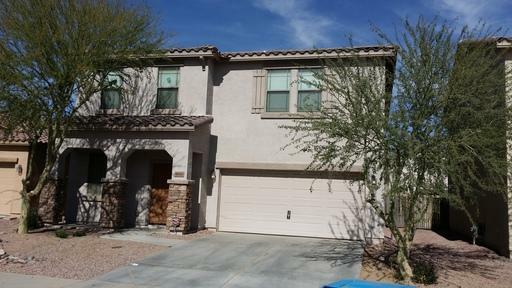 4 Beds and 2.5 baths........... - Great 4 bedroom with 2.5 baths in Laveen Farms. This home boasts a living room, formal dining and a family room on the first floor. Refrigerator, washer and dryer are included for your convenience. Upstairs we find a large master suite with an en suite bath, separate tub and shower. Also 3 secondary bedrooms and a guest bath. This home has a loft for the kids to play and study. This backyard has a grass area and a patin for grilling outdoors. At least 267 Trulia users voted on each feature. "Montana Vista in Laveen is a very safe, friendly area with beautiful greenways and walking paths. It backs up to the Chavez Park, Library and Golf Course. Great for families!" "Casitas at Cheatham Farms is a beautiful community. It is gated and has a Tuscan style. Neighbors are pretty friendly and look out for one another. We have lived here for 7 years and absolutely is it!" "I've lived in the area for 3 years and love it here. The neighbors are friendly and look out for each other "
"It is still rural yet close to freeways and shopping. New freeway will be completed in the area in 2019 as will a new mall and theatre that will be within walking distance"
"always road construction going on no matter where im going. they make these roads so narrow then a coupke years later they try and expand them "
"lots of parks but none fenced in like dog parks. play area for kids and lots of hoa's that keep everything nice and pretty in your neighborhood"
"Ok there some traffic for construction reasons. But not too bad depending where you are headed to go to"
"The neighborhood is nestled away from the main road (Baseline). No one knows the neighborhood unless they travel South of Baseline." "Love it haven’t been any complaints as long as they clean up after their dogs take care of they business "
"Most dogs are either on a leash or in closed yards. Very rarely do I see stray dogs. I see stray cats more often. " " It's quiet and friendly. People are friendly and helpful, want to be neighborly. The neighborhood is kept clean and respectable. " "I have lived in the area for 1 year. I've met the neighbors on both sides & across the street. Everyone is very pleasant and minds their own business"
"rarely is there any violent activity, and its very peaceful. no coyotes, low traffic, consistent police patrols"
"I don’t like living in Laveen. Looking to move by August. High crime, congested and not a safe and secure feeling living here. Always traffic day or night. Nice houses but not as safe as one would expect based on the HOA rules and more kept up properties than most areas. " 6918 W Maldonado Rd, Laveen, AZ 85339 is a 2.75 bathroom, 2,598 sqft single-family home built in 2006. 6918 W Maldonado Rd is located in Laveen, Laveen. This property is not currently available for sale. 6918 W Maldonado Rd was last sold on May 26, 2006 for $250,211 (100% higher than the asking price of $1,250). The current Trulia Estimate for 6918 W Maldonado Rd is $254,964.